We will drive to Lucca today and settle in with our friends for the weekend. With a little luck our friends from Milan will drive down to join us and we will be making homemade pizza in the outdoor "forno." Hmmm - if I get up early and can get an internet connection I can watch the HSN World Gypsy Launch this morning. 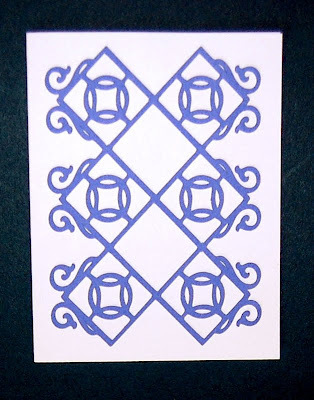 Now there are two rows of three with a filigree effect. One is turned 180 degrees and they are welded together. This reminds me of old iron gates - maybe we will be seeing some. Diane, sounds like your days are full of fun...the pizza party sounds scrumptious. Love the card design today...thanks for sharing with us, have a wonderful day!